So what is this thing and where did it come from? If you have time, I'll tell you the story. To tell that story, we need to go back a few years. I got to know a couple of interesting characters at a bar in Chicago called the Exit. It's not really a biker bar as such, but does include some old bikes in the decor and I knew the manager there who was into old British bikes. To cut a long story short, a friend of mine introduced me to his buddy and I found out the these two characters had a pair of GT750 Suzukis. The details of who owned what and how complete they were, weren't at all clear but it sounded to me as if the one that ran belonged to one guy and the remnants of the other belonged to my friend. Fast forward to the summer of 2005. My friend was moving and decided it was time to let the GT750 go and he wanted it to go to a good home. Time will tell, if that was a good judgment call or not! So I dragged home the remains of a GT750 which was missing most of the electrics, exhausts, and the side covers, and it generally needed a huge amount of work. In theory I was given the bike for free, but what a cost that turned out to be. I knew it was not destined to ever look stock again and when I moved it out of storage a year later, much of the stock stuff left in a dumpster. In the meantime I had been reading everything I could about the Suzuki triples and had been squandering my pennies on parts on ebay in order to improve the GT750 and to make sure it would make a huge amount of power and would handle like a modern bike - What was I smoking? Well I don't smoke so it must have been some chemical in the air or water, or temporary insanity. 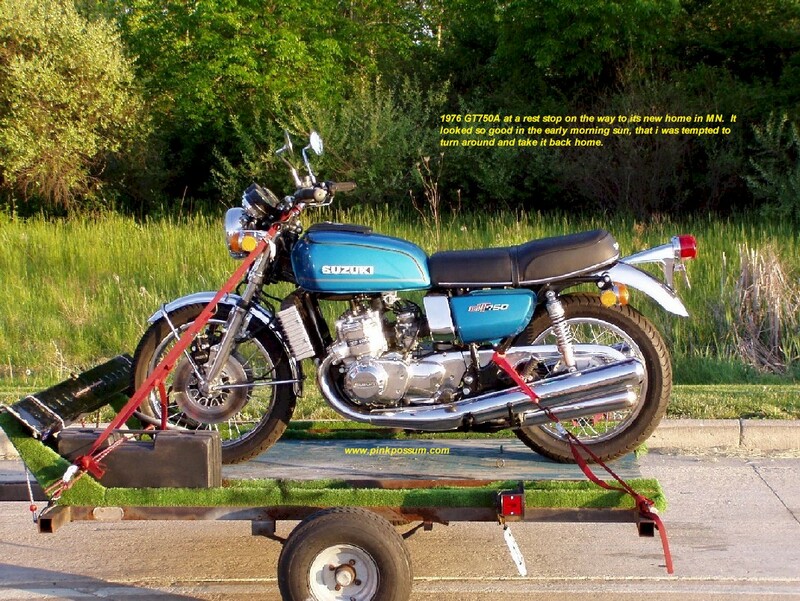 In the summer of 2006, I spotted a complete GT750A on ebay and it was a few miles from my place and in a moment of spontaneous insanity, I put in a bid and won it. The motor on that bike was stuck and had been sitting in the one and only owners garage since about 1986 and was in generally poor health. Don't ask why someone with one dead GT750 would buy a second one! I still have no idea why I bought it. The seller told me a story about buying the bike when he was in college and that he and his buddies had ridden out to California on their bikes. 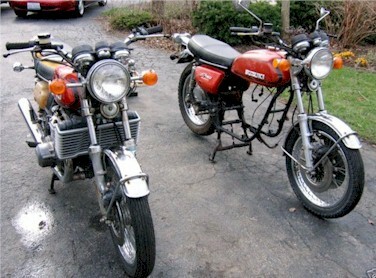 One had a Z1, the other a Suzuki GS750 and the seller had the GT750 Buffalo. A nice story from "back in the day". It was so complete, that any ideas of plundering it for parts went straight out the window. I sold off the Vetter Windjammer fairing which was in really nice condition, and dumped the sissy bar. The bike was stripped to the last nut and bolt and rebuilt. 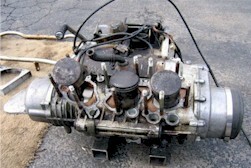 Needless to say, some of the parts on the first bike were in better shape that this one and were used in the rebuild. That was the time that I realized that I had thrown some good stuff away. Such is life. It turned out OK in the end. It looked great, ran like a train and smoked nicely. 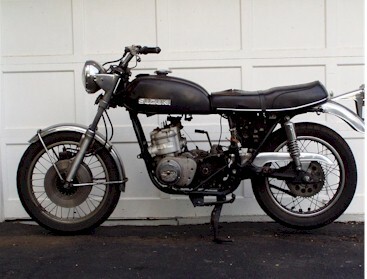 The part of the story I like best, is that the guy that bought it started to tell me a story about himself and his buddies and how they rode out to California and that one of his riding buddies had a GT750 - just like this one. He had been looking for a similar bike for a reunion trip he was planning. When he saw the original title, he couldn't believe it. It was the same bike and the same owner from way back in the late seventies. There are those that believe in coincidence, and those that don't. I'm starting to wonder! See here for more about the bike that distracted me. So now I have spent almost a year building and prepping a bike only to sell it and not much progress on the original speedy racer project. 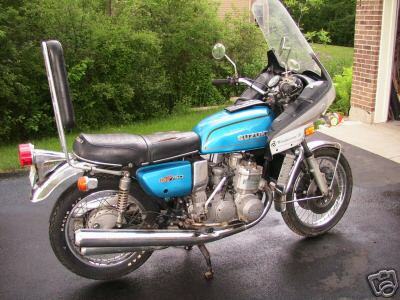 Early 2007 a friend of mine in Michigan called to let me know he was bidding on a pair of incomplete 74 L model GT750's and he only wanted one and would I like the other. Of course I said yes. So now I'm thinking I would rebuild it to stock as a nice runner, but I just did that with a nicer starting point on the blue bike, so that plan didn't get out of the starting blocks. I still had the carved up first L cluttering up the shop, so I wanted to try something different. I had a spare Yamaha TZ350 alloy tank that could have been made to fit with a little creative fabrication. Maybe i could turn this one into a period looking cafe racer.